Red squirrels are common in these woods. A red squirrel's cache of food. Just north and west of the University of Alaska Fairbanks, more than 1,100 acres of boreal forest, wetlands, open lands and fields — crisscrossed by a network of trails — provide habitat for a variety of wildlife. Historically, the area was known by the Tanana Athabascan people as Troth Yeddha' — "wild potato hill." Bounded by Farmer's Loop, Yankovich, Miller Hill and Sheep Creek Roads, this area contains a network of trails almost 15 miles long. The winding trails are popular year round, but they can be disorienting and it pays to keep your bearings. Lynx, marten, porcupine, marmot, snowshoe hares, squirrels and other small mammals inhabit the area, and bears, wolves and coyotes are seen passing through. Moose are common, and cows are often seen with calves. Fox frequent the area, establishing dog-like olfactory signposts, and cross-country skiers report catching the musky, slightly skunky odor of fox urine while skiing the trails. Muskrat, wood frogs and a variety of waterfowl and other birds can be found near Smith and Ballaine Lakes. Smith Lake, off Sheep Creek Road on the western edge, is one of the best wildlife viewing spots in the area. Geese, ducks, grebes, loons and variety of waterfowl can be found on the lake. Gulls nest in the trees near the lake and red-winged blackbirds and shorebirds can be found in the surrounding cattails and rushes. Muddy chutes and trails lead to the water, evidence of muskrats. Tiny trails worn through the moss on the floor of the spruce forest mark the routes of voles and mice. Dragonflies and aquatic insects abound in this fertile environment, feeding wood frogs and their tadpoles. Wood frogs are explosive breeders, mating and laying their eggs in an intense burst of activity in a short period of time. In May, the frogs' quacking, duck-like calls may be heard as males seek their mates. These hardy amphibians hibernate in shallow nests beneath the winter snow. 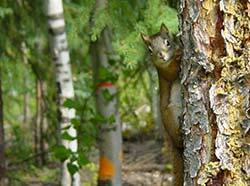 Red squirrels abound in the forested areas. Perennially active, they spend summers cutting spruce cones and caching food to get them through the long, lean northern winters. These half-pound dynamos stake out a territory an acre or so in size and fiercely defend it, preventing neighbors from raiding their cache or trespassing. The midden is the heart of the territory. This is a pile of fluffy brown cone bracts and stems, riddled with tunnels and holes. 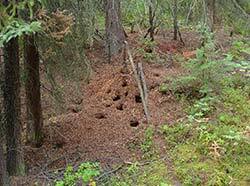 Beneath these cone scraps, the squirrel stashes thousands of green, seed-filled spruce cones. Smith Lake can be reached from the trail system parking area on Sheep Creek Road, near the Agriculture and Forestry Experiment Station. Park and then walk north along the road for a few hundred feet. A trail cuts through the spruce and the lake can be seen through the trees. It's also accessible from the main trailhead near the big radar dish on the UAF West Ridge. Parking and access for the east side of the trail system is available at Ballaine Lake, on Farmer's Loop Road. The University of Alaska Fairbanks Large Animal Research Station, nearby on Yankovitch Road manages captive caribou, reindeer and muskoxen used for research. The station offers tours, providing a close-up look at these animals.